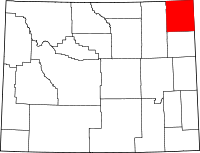 Crook County was created by the legislature of the Wyoming Territory on December 8, 1875, from portions of Albany and Laramie Counties. It was organized in 1888. As of the 2000 United States Census, of 2000, there were 5,887 people, 2,308 households, and 1,645 families in the county. The population density was 2 people per square mile (1/km²). There were 2,935 housing units at an average density of 1.0 per square mile (0.4/km²). The racial makeup of the county was 97.86% White, 0.05% Black or African American, 1.02% Native American, 0.07% Asian, 0.25% from other races, and 0.75% from two or more races. 0.92% of the population were Hispanic or Latino of any race. 34.1% were of German, 14.6% English, 7.8% Irish and 6.8% American ancestry. As of the 2010 United States Census, there were 7,083 people, 2,921 households, and 2,016 families in the county. The population density was 2.5 inhabitants per square mile (0.97/km2). There were 3,595 housing units at an average density of 1.3 per square mile (0.50/km2). The racial makeup of the county was 97.2% white, 0.7% American Indian, 0.2% black or African American, 0.2% Asian, 0.6% from other races, and 1.2% from two or more races. Those of Hispanic or Latino origin made up 2.0% of the population. In terms of ancestry, 38.8% were German, 16.5% were English, 14.5% were Irish, 9.5% were Swedish, and 3.8% were American. Of the 2,921 households, 28.4% had children under the age of 18 living with them, 59.2% were married couples living together, 6.5% had a female householder with no husband present, 31.0% were non-families, and 25.0% of all households were made up of individuals. The average household size was 2.41 and the average family size was 2.90. The median age was 43.6 years. The median income for a household in the county was $49,890 and the median income for a family was $55,765. Males had a median income of $47,821 versus $32,217 for females. The per capita income for the county was $24,520. About 6.5% of families and 7.8% of the population were below the poverty line, including 10.8% of those under age 18 and 8.0% of those age 65 or over. Crook County is one of the most overwhelmingly Republican counties in the nation, both in state and federal elections. The last Democratic candidate to carry the county was Franklin D. Roosevelt in 1932, and indeed Roosevelt in the following election – when he lost to Alf Landon by five percentage points – constitutes the last Democrat to pass forty percent. In the last ten Presidential elections the Democratic candidate has consistently received less than 23.5% of the county's vote. In the 2016 Presidential election, Crook County was the most Republican county in the most Republican state. In the Wyoming Senate the county is represented by Republican Ogden Driskill since 2011. In the Wyoming House of Representatives it has been represented by Republican Tyler Lindholm since 2015. This page was last edited on 4 April 2019, at 21:25 (UTC).